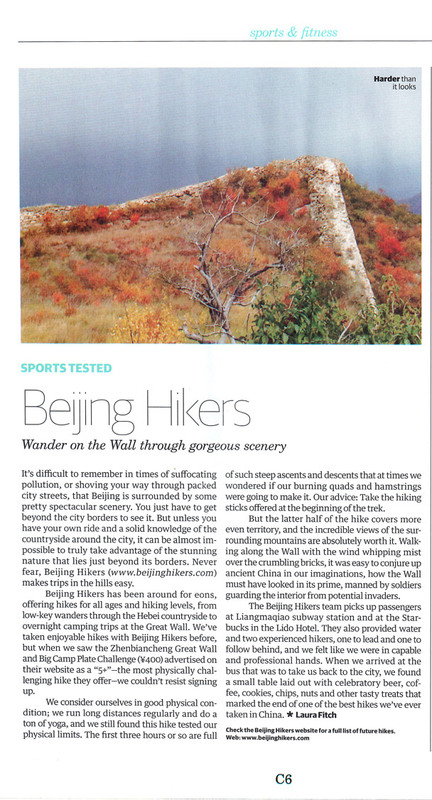 In Brief: Beijing Hikers reviewed in City Weekend magazine's sports section. Beijing's City Weekend magazine has a sports page as part of the community activities section, and their November issue featured us in their “Sports Tested” reviews. The writeup covers our rough and rugged Zhenbiancheng to Big Plate Great Wall Challenge, which we did in early October, and goes on to cover the author's impression of the hike organisation, as well as other general Beijing Hikers-related things. Thanks for such a detailed review, Laura! If you have a love for the great outdoors, Beijing Hikers are here to introduce you to some spectacular scenery. It’s difficult to remember in times of suffocating pollution, or shoving your way through packed city streets, that Beijing is surrounded by some pretty spectacular scenery. You just have to get beyond the city borders to see it. But unless you have your own ride and a solid knowledge of the countryside around the city, it can be almost impossible to truly take advantage of the stunning nature that lies just beyond its borders. Never fear, Beijing Hikers makes trips in the hills easy. Beijing Hikers has been around for eons, offering hikes for all ages and hiking levels, from low-key wanders through the Hebei countryside to overnight camping trips at the Great Wall. We’ve taken enjoyable hikes with Beijing Hikers before, but when we saw the Zhenbiancheng Great Wall and Big Camp Plate Challenge (RMB400) advertised on their website as a “5+”—the most physically challenging hike they offer—we couldn’t resist signing up. We consider ourselves in good physical condition; we run long distances regularly and do a ton of yoga, and we still found this hike tested our physical limits. The first three hours or so are full of such steep ascents and descents that at times we wondered if our burning quads and hamstrings were going to make it. Our advice: Take the hiking sticks offered at the beginning of the trek. But the latter half of the hike covers more even territory, and the incredible views of the surrounding mountains are absolutely worth it. Walking along the Wall with the wind whipping mist over the crumbling bricks, it was easy to conjure up ancient China in our imaginations, how the Wall must have looked in its prime, manned by soldiers guarding the interior from potential invaders. The Beijing Hikers team picks up passengers at Liangmaqiao subway station and at the Starbucks in the Lido Hotel. They also provided water and two experienced hikers, one to lead and one to follow behind, and we felt like we were in capable and professional hands. When we arrived at the bus that was to take us back to the city, we found a small table laid out with celebratory beer, coffee, cookies, chips, nuts and other tasty treats that marked the end of one of the best hikes we’ve ever taken in China.